As deeply colored and glossy as black pearls, tiny uncooked black lentils have a flavor that is earthy, nutty and satisfying. 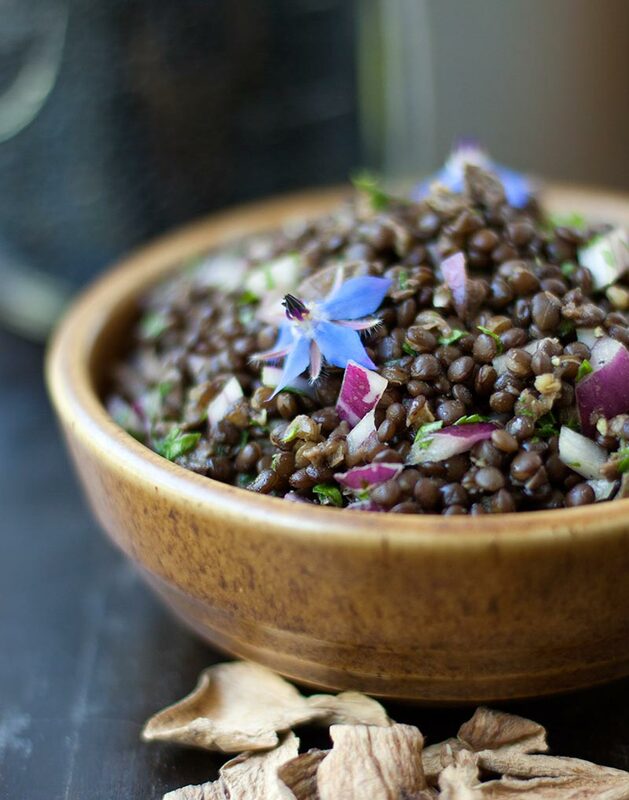 Black lentils are very like lentilles du Puy, also known as French green lentils. Both varieties differ from common brown or green lentils in significant ways. Black and green lentils take less time to cook and they both hold their lens-like shape better, making them perfect for salads and side dishes (although they’re both wonderful in soups, too). 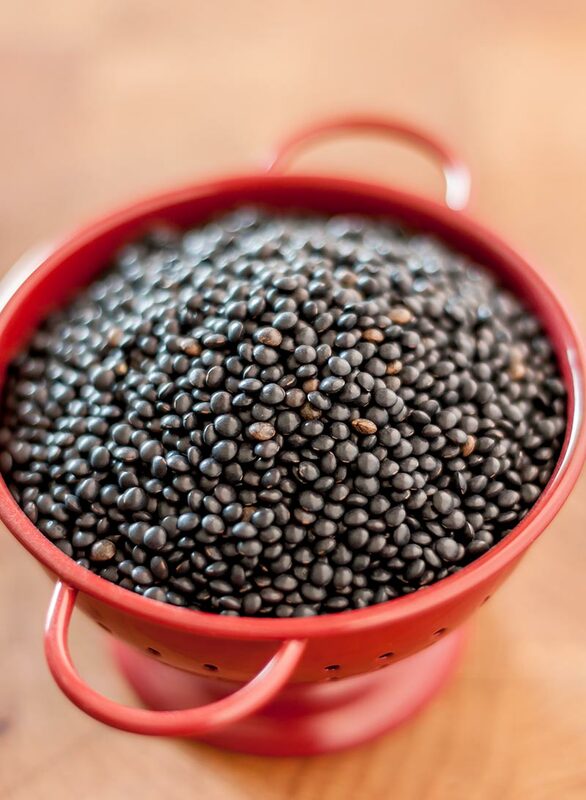 Black lentils lose their ebony black color in cooking, becoming something more akin to a deep olive green. Attractive, yes, but the real appeal of black lentils lies in their magnificent, but understated flavor and pleasantly firm, al dente texture. Once cooked, they can be served in a variety of ways, but one of our favorites is simply to toss them with a classic Dijon mustard- spiked vinaigrette. This time around, we added a generous amount of our favorite dried porcini mushrooms to the simmering lentils, along with the deeply flavored soaking liquid used to reconstitute the mushrooms. The robust, woodsy taste of the mushrooms melded so well with the lentils that we’ll be using this recipe again and again. In this recipe, a wild-caught grilled salmon steak is gently nestled atop a mound of black & mushroom salad. A few spicy arugula leaves, a squeeze of lemon, freshly pulled radishes and a scattering of edible borage blossoms were all that was needed to finish the dish to perfection. 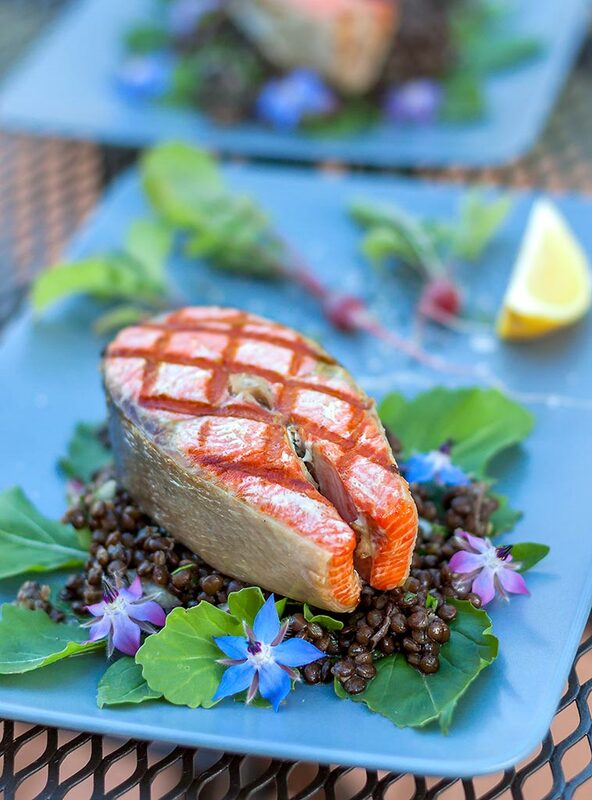 Pat the salmon dry and lay in a shallow pan just large enough to accommodate all 4 pieces. Drizzle with the olive oil and add a little salt & pepper. Turn the salmon in the oil until all sides are well coated. Preheat the grill. When hot, oil the grates well to prevent sticking. Place the salmon on the grill, rotating it 90 degrees after 2 – 3 minutes to give it attractive cross-hatched grill marks. After another minute or two, turn the salmon and cook for an additional 2 – 3 minutes, or until the desired level of doneness is reached. Remove the salmon from the grill. Arrange a small handful of arugula on each serving plate. Place a generous helping of the dressed lentil mixture (see below) in the middle of each pile of greens. 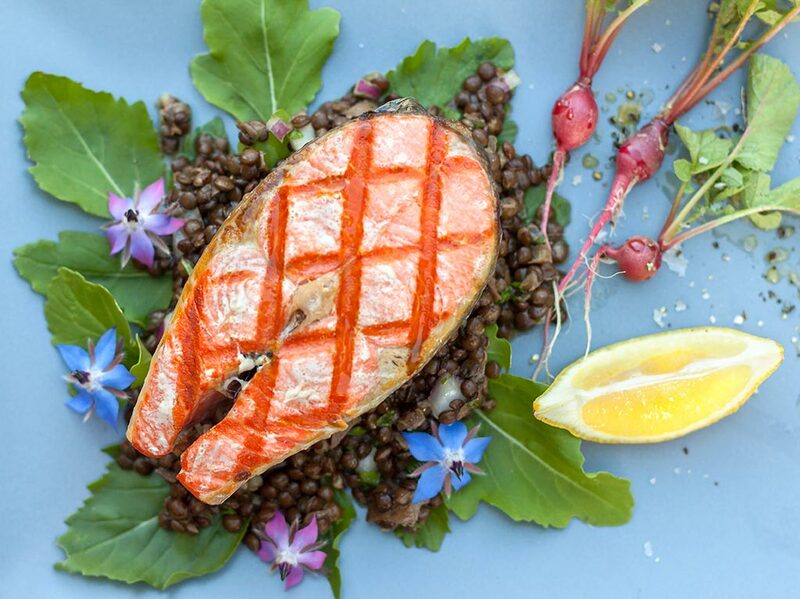 Top the lentils with a piece of grilled salmon, garnish with fresh herbs and serve. This earthy lentil salad makes a wonderful side dish with any entree, but it’s equally good all on its own. Scatter some toasted walnuts, dollops of goat cheese or slivers of sausage over the top for a light, but satisfying meal. We like the robust, earthy flavor of porcini, so we used a full ounce, but you can vary the amount and variety of dried mushrooms according to your personal taste. Place the dried mushrooms in a bowl and cover with 2 cups very hot water. Allow to rehydrate for 20 – 30 minutes. Drain the mushrooms, reserving the soaking liquid. Rinse the softened mushrooms under cool running water to remove any traces of grit. Drain well and chop coarsely. Pour 3 cups of water into a medium sized pot. Add the reserved mushroom soaking liquid, taking care to leave any grit behind. Bring to a boil. Rinse the lentils well and carefully pick over for stones. Add the lentils to the pot along with the chopped mushrooms. Reduce the heat to a simmer and cook for 20 – 25 minutes or until the lentils are just tender, but still firm. While the lentils are cooking, make the vinaigrette. Whisk the mustard, vinegar, olive oil, porcini elixir (if using) and a pinch of salt and pepper together in a large bowl until emulsified. Set aside. When the lentils are done cooking, remove them from the heat and drain them well. Rinse briefly with cold water to halt cooking and drain again. Add the lentils, diced onion and chopped parsley to the bowl with the vinaigrette, tossing well to coat. Taste, add salt and pepper as desired.